I love looking out the windows lately. The Maple trees are a gorgeous golden color, though they are quickly losing their leaves. Within the next week most all of them will be on the ground but you know what? That's when the fun begins. Leaf piles! The past several days there's been a Purple Finch hanging about. No mate, just him. And oh my goodness, the flocks of Grackles are out of control! They fly through by the thousands, literally, sometimes landing just long enough to clean out the bird feeder. Rats in the sky.
. . . and the trees. They may act like rats but they sure are vibrant and gorgeous! We have so many Cardinals right now. At last count 6 males and 3 females. Most of them are juveniles. I guess it was a prosperous year. 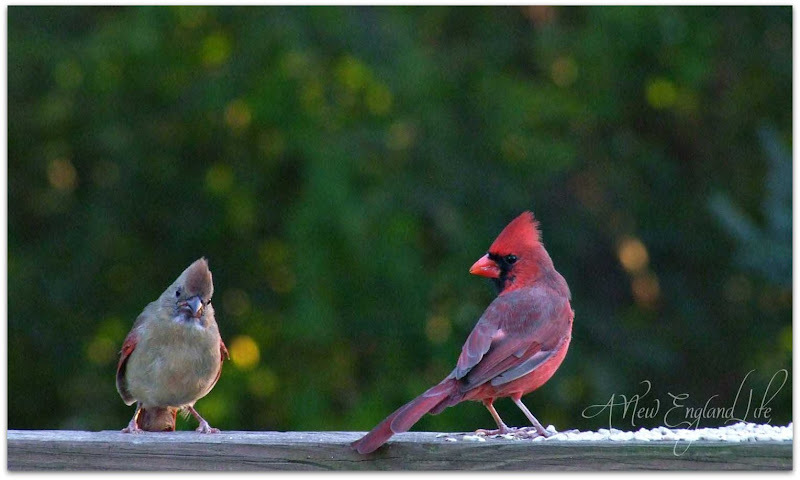 Every morning and evening I put out Safflower seeds on the railing just for the Cardinals. It's a great way to begin and end the day. In case you didn't notice I added a little section on the upper right side of my blog. Seems I keep finding so many wonderful blogs lately that I thought I'd try to highlight 1 or 2 a week. Some are new bloggers, some have been around a while. I hope you'll visit them! What pretty pictures, especially of the birds and in particular, the cardinals. 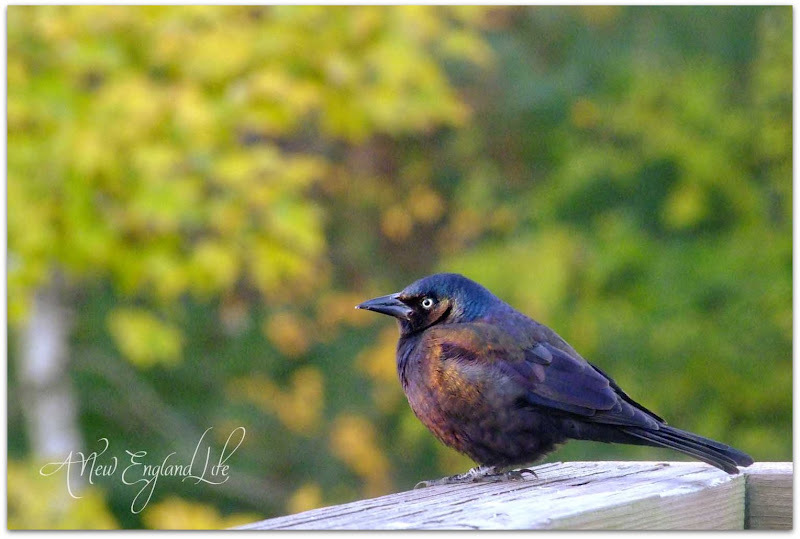 We have had thousands of black birds and grackles flying through New Brunswick as well - maybe the same ones you had. Do you suppose? They are on their way south afterall. There have been pairs of cardinals nesting in our area the past few years but I have only seen one female - ever! What a great way to start your mornings. They look like they're kissing. I saw a murder of crows while driving this afternoon but though I stopped to photograph them the shots were no good. boo hoo! So I'm really enjoying yours. 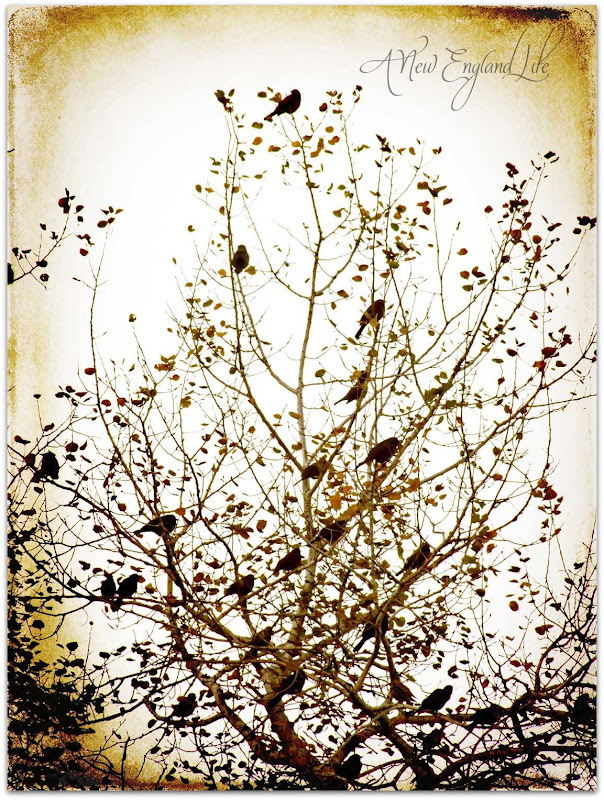 Love the textured photos of the birds! I should put seeds out on my deck... it seems we never have birds hanging around for me to photograph! Beautiful, Sharon. Love all your photos out the window, too. And beautiful bird photos! Can't believe you captured the flocks of Grackles! It sure is pretty out there. It's at peak where I live too. Just gorgeous. Your bird photos are fabulous. I love cardinals. They are so regal. I enjoyed looking out your windows! What a beautiful sight! Great captures of the cardinals, and the grackle! When we were still in IL there were great hoards of grackles everywhere! I love your post! Beautiful pictures and close ups of the birds. I laughed and laughed about the "rats in the sky" comment. We haven't had the flocks of migrating birds yet, but then we're further south than you. I don't usually start feeding the birds until the snow flies, but I may have to try the safflower seeds. We have so many squirrels, they hog everything. To me they are "rats on the ground". Did you know they are in the rat family? Thank you so much for featuring my blog. I am moved to tears and you are so very kind! That last shot is amazing. Your timing must be impeccable. I love bird watching too, and have been since I was a little girl. Everything I plant, I keep in mind the birds' food and shelter requirements, so I have built up a good bird population to watch. The huge flocks of grackles are amazing to see. I haven't seen the ginormous flocks yet, but will soon. Sweet, sweet pics of the cardinals. And I wonder why the little finch is all by himself? 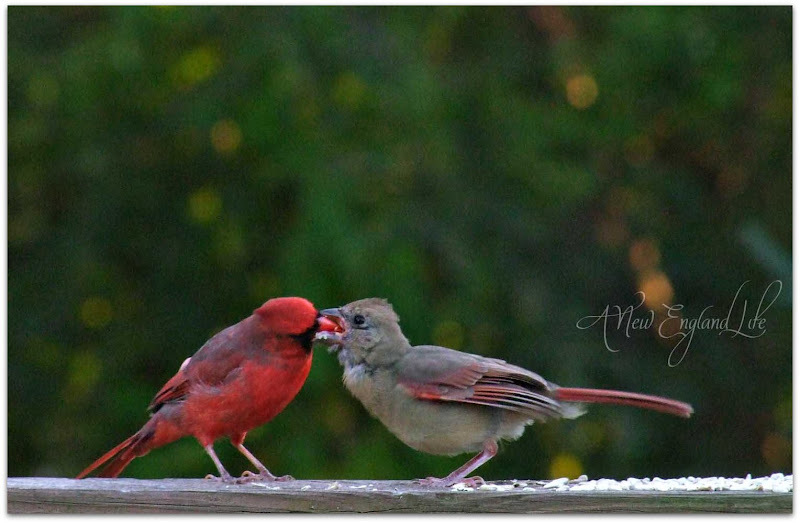 I'm partial to the cardinal birds, and these two are precious! What a pretty view! You got some great shots of the birds. The grackles leave a terrible mess when they come thru. Beautiful images, all. I do love the intimate bird photos. You've captured the subtle colours in their feathers beautifully. Our birds have been very active and vocal lately, and I've seen many sitting way up high in the treetops where the leaves are completely gone. This morning it was the cardinals that were singing the loudest as we sat on the front porch with our coffee. The crows were coming in a close second though. I love the up-close pictures of the birds! What a pretty view out of the windows. I love looking out at this time of year. Love your fall pictures! Thank you for sharing your insights! I love the view from your window - and the birds. I haven't seen a cardinal for years. We just don't have them here. The leaves are all down now - a big wind took care of the last of them - and we are well and truly into the rains of November already. The purple finch is gorgeous. Just got back from Rye on Monday night. The leaves were beautiful and we LOVED the weather. Things were good on Wallis Rd, she is 92 and he is 93. Had Petey's on Sunday for lunch, very good. Ate at The Golden Egg and Bob's Chicken, both excellent. Had a great trip, should have met up with you, maybe next time! I love those window shots Sharon! 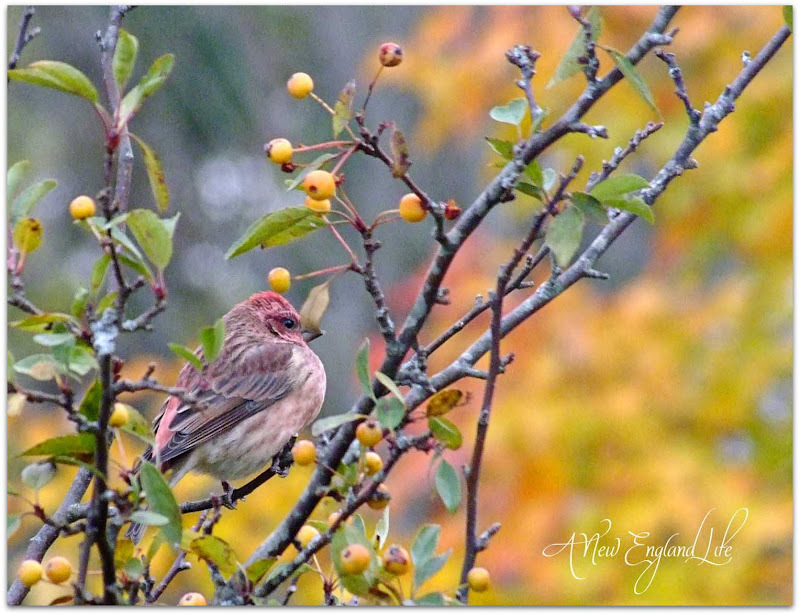 And, the purple finch is perfectly framed in all his beauty. Beautiful series of photographs! 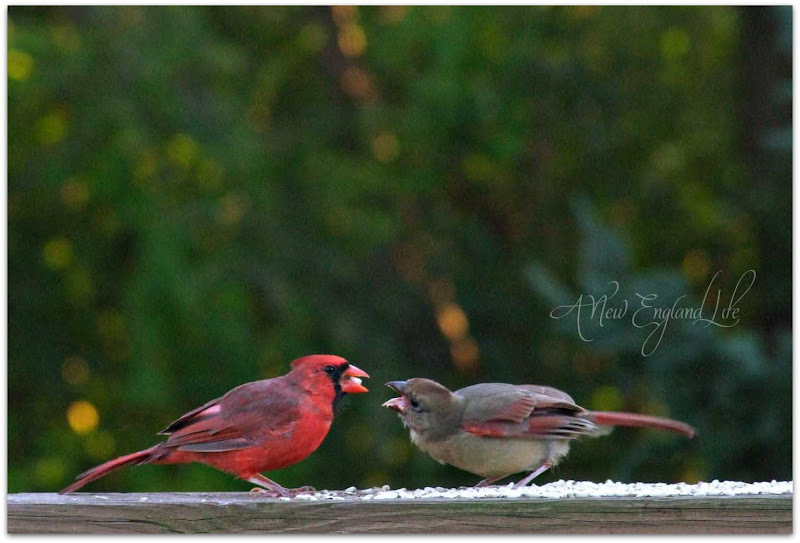 I loved the cardinals and thanks for the idea about the seeds - I will try that and see if I can get some bird shots! The colors up there are gorgeous - hopefully ours will start turning in the next week or so. 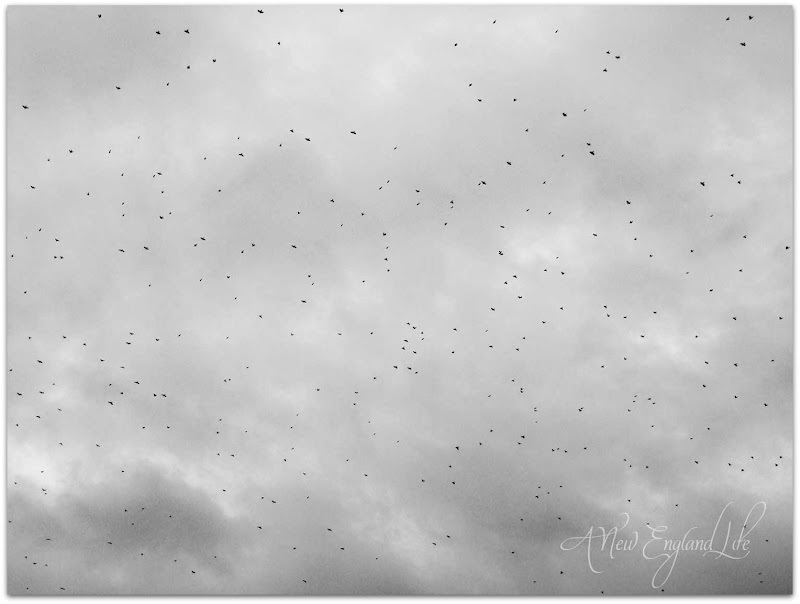 I love the shot of the masses of grackles in the sky! I missed the massing of the redwing blackbirds in the marsh this year, but I love to just stand and watch them cover the skies! 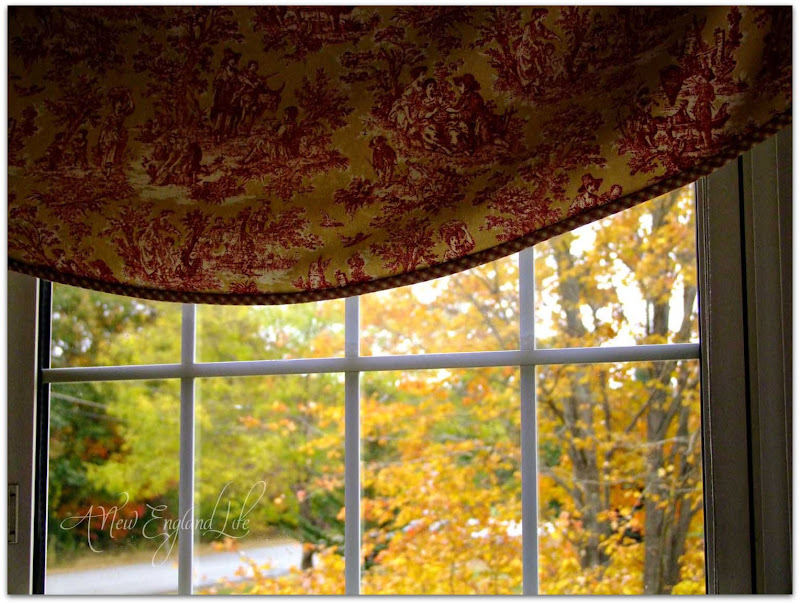 Yes, the views out our windows these days are always beautiful -- like seeing a painting on the wall. 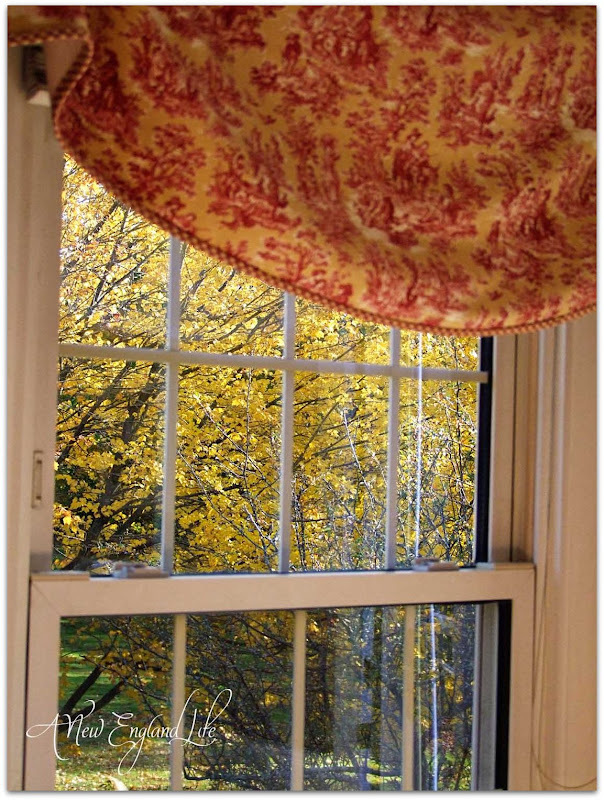 I love those yellow maple leaves -- Norway maples are junk trees, but their autumn garb sure is beautiful! Being a bird lover,I enjoyed seeing the purple finch and grackle. We don't have those in western Pennsylvania! I love the view from your window. I miss seeing Cardinals and Blue Jays and Robins...we just don't have them in our area. We have a blue jay but it's not the same as the east coast blue jay. Beautiful pictures. You have captured their personalities! Hello, I love visiting your blog. Your photos are just terrific. I absolutely love these bird photos! I have only ever seen the Red Cardinal in reality, (I have a sister in Arkansas), they are all so beautiful. TFS.